You've found the key that unlocks true love, now share your joy with your friends and family. Stylish and practical, our Key to my Heart Dangling Charm Wine Stopper is the perfect favor for your bridal shower or wedding. 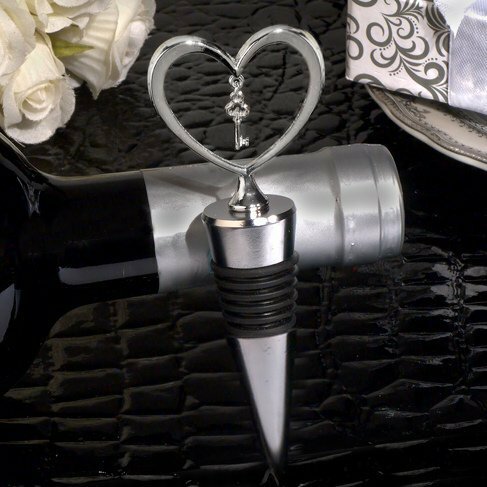 Each bottle stopper has a silver metal open heart design top with a dangling key charm in the center. It is attached to a metal base and measures 4.5" long. Ready for gift giving, each favor is packaged in an elegant silver and white damask print gift box with a clear top. It is finished with a satin ribbon and matching thank you tag.